For those of us who can’t exactly hop on a flight to our dream destination next week, certain wines – and their ability to reflect a distinct sense of place – can be the next best thing. 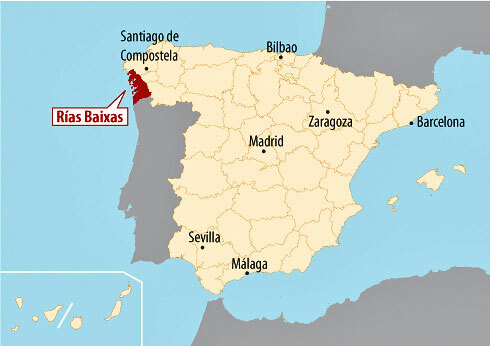 One example is Albariño from Rías Baixas, a white wine that almost tastes like sitting at the beach along Spain’s cool, misty northwest coast. Rías Baixas is unlike anywhere else in Spain. The small coastal D.O. sits in the broader region of Galicia, also known as “Green Spain” due to its cool maritime climate and abundance of rain – a kind of oasis in a country known for its hot, dry summers. This climate is a perfect match for Albariño, a thick-skinned grape variety native to the region. While there is plenty of rain in Rías Baixas, there is also ample sunlight, which allows Albariño to ripen and ultimately express notes of white peach, apricot, melon and honeysuckle. Still, the region’s cooling coastal influences produce wines that are light and elegant, chock-full of mouth-watering acidity. The wines often show a slight salinity, mirroring the cool, salty air in which their grapes thrive. It is no surprise that Rías Baixas wines have burst onto the global wine stage, adored by trendy sommeliers and industry influencers. Comparable to some of the most renowned white wines in the world, Albariño from Rías Baixas offers exceptional value – you can get all the crisp acidity and minerality of a Chablis or a Sancerre for a fraction of the cost. The wine’s fresh style also makes it an ideal pairing with a wide range of foods, but it really shines with its region’s staple cuisine: seafood. So, what are you waiting for? Pour a glass, grill some oysters, and take a mini-vacation at your dinner table.